Avoiding flood insurance-related violations requires understanding loans, notifying customers and/or assessing insurance coverage requirements. April may bring showers and flowers, but it can also bring snow and ice thaws with torrents of runoff and flooding. The threat of flooding ranks high on the risk meter for bank loans secured by improved real property. One critical difference between flood and other regulatory requirements is that it is not limited to consumer-purpose transactions, and may expose banks to greater risk for larger, commercial-purpose loans. Remember those magic words: “Make, increase, extend, or renew.” Lenders must initially determine whether a prospective loan will be secured—including security interests taken as an abundance of caution—by residential or nonresidential buildings or mobile homes that are or will be in a SFHA covered by flood insurance under the NFIP. Whether the structures are in a covered SFHA or not, the lender is required to document the results of the flood hazard determination on FEMA’s Standard Flood Hazard Determination Form (SFHDF). You must also retain a hard copy or electronic record throughout the term of the loan. A lender may rely on its prior determination of the property’s flood status, but only under certain circumstances. A flood hazard determination must be conducted before loan closing, and flood insurance, if required, must generally be purchased prior to loan closing. If the property securing the loan is or will be in an SFHA, the lender must notify the borrower, even if insurance is not available under the NFIP. A record of the borrower’s receipt of the notice must be maintained for the life of the loan. No notice provided is a common violation. Flood insurance coverage is generally required to be the lesser of 1) the loan’s outstanding principal balance or 2) the maximum amount of coverage available under the NFIP for the property serving as collateral. The maximum coverage caps in an NFIP-participating community are $250,000 for a residential building and $500,000 for a nonresidential building. The Biggert-Waters Flood Insurance Reform Act of 2012 (BWA) increased the maximum amount of coverage for a non-condominium residential building designed for use for five or more families from $250,000 to $500,000, effective for new policies, renewals or change endorsements made on or after June 1, 2014. 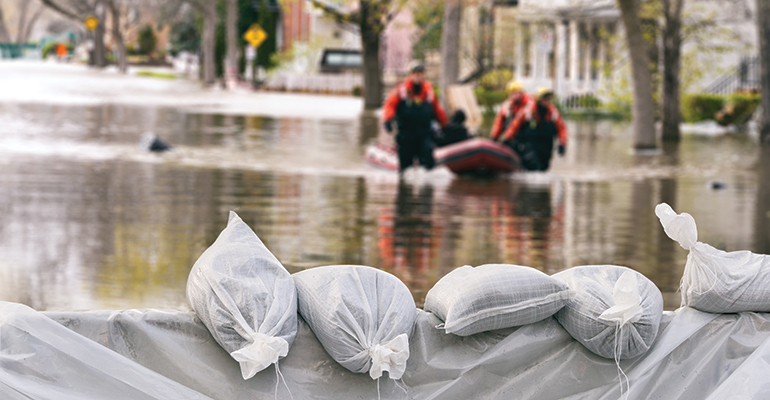 If a lender or servicer determines at any time during the term of the loan that the collateral has less flood coverage than required, it must take steps to force place flood insurance. Interagency Flood Q&A 61 states that if a borrower fails to obtain insurance within 45 days after notification, the lender or servicer is required to purchase the insurance on behalf of the borrower on the 46th day. Common compliance violations include inadequate or no insurance coverage, lapsed insurance, and failure to force place insurance or comply with force placement rules. Flood compliance rules include condominium coverage, flood insurance premium and fee escrows, coverage for home equity loans and home equity lines of credit (HELOC), and services provided by a third party. Sound compliance practices, including strong internal controls to conduct and document flood hazard checks, monitor flood insurance coverage on covered loans and implement force placement, stem the tide of flood compliance issues.